In order to get more accurate data about how people think what leadership is, how they understand leadership and what their attitudes towards good leaders, we group decided to do two types of researches namely focus group and descriptive research. Firstly, we interviewed four people from different social status. Addriaan—he is an Australian who was resigned from finance department from Central TAFE. And now he starts his own cleaning business with eight employees. Although his business scale is small, his performance is absolutely a leader. Hence, I did a quiz with him called “the Efficiency of Your Organization”. This quiz focuses on the organization efficiency evaluation. It considers the aspects from changes, mission, communication, human resources policies, performance management, competency development and management, cultural diversity and assigning blame. Analyzing the results he ticked, I feel that he is a pretty well-performed leader which is the same as his employee’s recognition. However, there is an unexpected answer form the result. The one is about the HR policy. He said he prefers listening diverse opinions from the staffs, but during the decision process he would like to make a judge himself. Employee’s ideas will be considered as decision improving and information gathering process, which may be not taking quite a long time. Generally, the result indicates that his organization is running effectively in the area while it also have a great ability to further increase productivity and build positive relationships between leadership, employees and customer. Gem—he is a graduated student from ECU. He is working in a mining company as a chemical researcher. He has been working in this area for 3 years already. And now he becomes a supervisor of the lab. Gem came to Australia from Brazil 12 years ago and studied here from junior high school. I interviewed him through doing a small quiz called “How You Rate as a Leader”. There are several interesting questions in this quiz and of course his rate of being a leader can be generated. For instance, one of the question is “in you childhood what was your ‘Gang Rank’?” His answer is “the geeky one: noted by none.” The other impressive one is, “what does EQ meant to you?” He gives the answer as “it is a way of empathizing with how your colleagues may be feeling.” Hence, the final result shows that he is a creative, assertive and empathetic person who is easily able to draw groups together and seem prepared to do what can do in potential. Hanna—one of our group member, she is currently a student majoring in international business in ECU. She is being studying in Perth around 2 years and is going to graduate after this semester. The reason why I would like to interview an inexperienced person to do this quiz is that I am interested in finding out the current understandings of leadership method from students. I gave the quiz called “Emotionally Intelligent Leadership Quiz”. I asked her to finish the quiz on the basis of imaging yourself who is a leader and what you should perform in the organization. In fact, I am very satisfied with her result that is fit for her identification right now. Her score is just 60 which belongs to the second level—learning. Obviously, she has already had a number of leadership strengths. However, there is much room for improvement. The answer analysis also provides a suggestion that she may further develop her retention skills and get ready to learn new strategies. I believe once she works in an organization, she will be an excellent leader in future. Then in order to get more adequate information, we sent out 100 shares of questionnaire to do so called descriptive research. 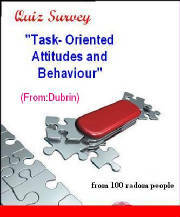 We have done a survey of 100 random people by using a quiz from Dubrin- Task oriented attitudes and behaviors. The test showed that most people have got the capabilities of task oriented attitudes and behaviors for leading. l 90% of the people quite clearly know the quality goals. l 85% of the people have good communication with their group members. l 78% of the people agree that they should spend so much time with computers. l There are still 60% of the people helping other group members with their planning when they have finished their own works. The quizzes also point out that although most people often establish close relationship with subordinates, they still know that “task” is more essential than “people”. On the one hand, without people’s supports, people could not achieve the future goals. On the other hand, in order to gain the goals, leaders have to hold the right directions, but it does not mean they are authoritarian leaders. They have to use the power and relationships properly. In another word, they have to know that they have responsibilities for the whole team; meanwhile they could use the relationships.